Two unorthodox economists have written about the crisis in 1000 words or less. They’re both interesting because they depart so fundamentally from the mainstream story. Steve Keen says it’s all about debt; Michael Roberts, the rate of profit. Both the crisis and the apparent boom before it were caused by the change in private debt. Rising aggregate private debt adds to demand, and falling debt subtracts from it… The crisis itself began in 2008, precisely when the growth of private debt plunged from its peak of almost 30% of GDP p.a. down to its depth of minus 20% in 2010. The recovery, such as it was, began when the rate of decline of debt slowed. Across recession, boom and bust between 1990 and 2012, the correlation between the annual change in private debt and the unemployment rate was -0.92. Keen says that banks create money rather than money existing already, and that much of the debt created through the banking system ended up being used not just for useful purposes but to bet on asset prices rising. Finance ended up being based on nothing but other people’s bets, and like John Kay said in an excellent Financial Times article this week, the whole economy becomes hot air: bets on other people’s bets, which are themselves bets on your bets (this is a version of Keynes’s beauty contest, where he said that stock market prices aren’t really to do with underlying value but everyone’s perceptions of what everyone else’s perceptions are). I think that most economics should be based on an assumption that this sort of reflexivity always takes place. People quickly figure out that most economic variables, such as prices, are inherently social rather than having any pre-existing, fundamental value. As ‘laws’ like the Lucas critique and Goodhart’s law roughly say, as soon as any variable is targeted for policy purposes, it becomes useless because people get wise to what policymakers are doing. The Philips curve relationship probably did indeed fail for this reason. Modern neoclassical economics was always doomed to ignominy in part because, in an attempt to ape what it saw as the method of natural sciences, it attributed absolute truth to variables and relationships that in fact change. People aren’t atoms; they’re unpredictable agents, and the their social whole is more than the sum of their parts. As Lars P Sylls said in a recent blog about econometrics: “I cannot really see that it has yielded very much in terms of relevant, interesting economic knowledge” because so many relationships are unstable — and they may even depend on each other, with a two-way causality (I identify some specific examples of these kind of two-way relationships in sections 6.4 and 7.4 of my book). You can’t project history into the future in a determinate way, so economic policies might work for a few years but they can’t be guaranteed to do so in the future. But that’s a digression. 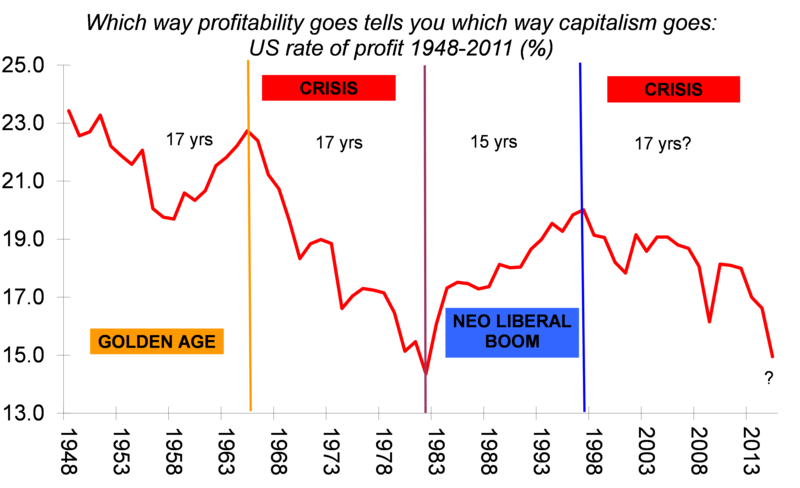 Keen adds the following diagram, showing that it’ll be many years before private debt falls back to anything like normal levels. Obviously the year 2027 is a stab in the dark because curves are rarely completely smooth, but the graph does show the magnitude of the debt mountain. It’s worth repeating for the umpteenth time that it’s private debt that matters, not just government debt. I’d hazard that most people don’t distinguish between the two. Private debt is about 450% of GDP in the UK, compared with roughly 80% for government debt. Keen thinks that instead of giving more handouts to the banks in the form of newly-minted money, we should give it to ordinary people with the proviso that the money be used to pay down their debts. Those without borrowings should be allowed to save the handout. Michaels Roberts instead focuses on the rate of profit. Like Keen he believes that “there is always the possibility of crisis”. But as a Marxist he doesn’t see debt as the key driving force behind the slump. The capitalist system of production for profit will falter if not enough profit is created to satisfy the owners of the means of production. And there is an inherent tendency for the rate of profit to fall. This is the underlying cause of all slumps. [Capitalists] compete with each other to sustain and increase their profit. To do so, they make workers work longer or harder, but they also increasingly use new technology to boost the productivity of labour to get more value. But this is capitalism’s Achilles heel. The accumulated cost of investing in new plant, equipment etc inexorably rises compared to the size and cost of the labour force. As only labour can create new value (machines on their own cannot do it), the profitability of each new unit of investment begins to fall. If profitability falls consistently, eventually it will cause a fall in the mass of profit. Then capitalists stop investing and ‘go on strike’. A crisis of production ensues. Capitalists try to top up their profits with new technologies, by exploiting workers more, and by gambling in new and more exotic forms of finance. The latter became particularly pronounced in the later years of the most recent crisis. Eventually, though, capitalists can’t buck the decline in the rate of profit. There are different ways of calculating profits but the following graph from Roberts shows that the rate of profit in the United States is running at one of its lowest points in the last 65 years, which is perhaps surprising given the story of relentless efficiency peddled in the media. Roberts agrees with Keen that clearing the debt overhang is key to the restoration of growth, but he sees the mechanism as being via profitability, which must first be restored to kick-start investment and economic growth. Roberts is more pessimistic than Keen, arguing that another huge slump will be needed to cleanse the system of dead capital. I doubt he’d think a debt jubilee would be enough to get the economy going again. According to some accounts, the likes of Bernie Madoff and AIG’s Joe Cassano caused the entire calamity themselves, flanked by the crony capitalists who stalked Wall Street. A few bad men infected the entire system. In a similarly individualist vein, Tyler Cowen said that Americans didn’t save enough and had taken on too much risk due to ‘investor hubris and collective delusion’. A bit of bad luck combined with poor governance to sink the economy. These sort of explanations are ridiculously superficial. Of course a handful of men couldn’t have caused the entire crisis. Greedy people have always existed, and their influence varies at different times. Low savings rates and an appetitie for risk had an impact, but they aren’t anything like the whole explanation behind the crisis, and they can’t be seen in isolation, without looking for more profound causes. Another thing that Roberts and Keen agree on is that debt ultimately precipitated the crisis and that deleveraging will take many, many years. Keen himself has written about what Marx called the “fictitious capital” created by “the “roving cavaliers of credit”. Roberts, though, perhaps believes himself to have identified a more profound process. For Roberts the creation of financial debt was only part of the overall process under which the capitalist attempts to identify new sources of profit, and must be seen alongside the increasing exploitation of labour and the search for new technologies. I find Keen a bit more convincing on the immediate causes. The correlation between the change in debt and the jobless rate is so strong, and years beforehand Keen was, for good theoretical reasons, so vehement that the crisis was coming, that it’s difficult to dismiss his analysis. Doubts about the labour theory of value aside, Roberts probably has the more convincing long-term story, but i’m doubtful about the predictability of the crisis based on the peak in profits around 1997. Why did the crisis happen in precisely 2007/8 and not earlier? Why the 11-year gap? Capitalism isn’t mechanistic enough to move in 15 to 17 year cycles. Economic behaviour is unpredictable, as I said above, and I am dubious about almost any analysis which talks of iron laws or long-term inherently stable relationships. That’s not to say that relationships can’t exist for a period of time, but attempts to predict exact timeframes are usually doomed to failure. It’s also easy to get drawn into identifying single causes for the crisis, although neither Keen nor Roberts do this. Lots of causes accumulated at the same time — like globalisation; the inadequacies of the Bretton Woods system; the Big Bang; central-bank independence; overspending by Western governments. The interdependencies between these factors are the interesting points of analysis: for instance the rise in fictitious forms of investment and the surge in personal borrowing effectively helped interest rates to remain at historically low levels throughout the 1990s and into the next decade, facilitating Blair and Brown’s spending splurge and Bank of England independence, and in turn feeding the bubble. Debt and profits are fundamental, but they affected and were affected by many of the other processes. Either way, both Roberts’s and Keen’s explanations of crisis are a welcome move beyond the conventional story. Any proper explanation of the crisis, and any new economics, if it is to be successful, needs to take into account not only the inherent tendency of capitalism toward crisis, but the methodological issues of reflexivity, uncertainty and multi-factorial explanation.